Prime Minister Modi will continue to take the nation by surprise, catching his political opponents offguard, says Shreekant Sambrani. Nirmala Sitharaman broke through the ultimate glass ceiling when she became India’s defence minister. That was the banner headline event in the latest reshuffle of the Modi Sarkar. We are not exactly a gender-sensitive society. Female foetuses continue to be aborted, girl children get the short end of the stick even from their own parents, young women get gratuitous advice about their clothing and behaviour from self-styled patriarchs, including many votaries of the ruling dispensation, brides are harassed for dowry and women, even small girls, walk in the shadow of possible physical and mental violence from known and unknown men. Even higher judiciary thinks that adult women need parental guidance in choosing their partners. Let us all cheer this true black swan event and wish Sitharaman Godspeed in discharging her greatly enhanced responsibilities. We should note that another feature of the changes in the central government is of even greater significance. Mass curiosity about this event, otherwise of interest mainly to the political cognoscenti, had risen to a fever pitch thanks to the incessant media coverage. The usual readers of tea leaves, doubtless abetted by whispers and leaks, managed to guess the names of the likely promotees and new entrants. But absolutely no one had any inkling whatsoever of the allocation of portfolios, save railways for Piyush Goyal. As was widely expected, a bevy of former bureaucrats -- R K Singh, Hardeep Singh Puri, and K J Alphons -- were among the new entrants. The prime minister yet again demonstrated his comfort level and trust in administrators he developed during his long stint in Gujarat. Soon after Modi became the prime minister, I had said (external link), 'Modi’s strategy was to run (Gujarat) as a business entity. For this purpose, he depended on two younger members of his team, both with business background and experience, Nitin Patel (present Gujarat finance minister) and Saurabh Patel (present Gujarat industries and energy minister). Modi trusted their acumen and gave them key responsibilities…. Towards this end, Modi depended heavily on the bureaucracy… Modi is now trying to faithfully put into practice the maxim ‘don’t-fix-it-if-it-ain’t-broke.’ …His equivalents of the two Patels in Gujarat are Piyush Goyal and Dharmendra Pradhan, both young and reasonably business savvy, in the all-important energy field”. That said, what is noteworthy is Modi’s apparently total faith in the bureaucracy’s multifaceted competence. The prevailing pattern of the administrative service members holding key decision-making positions reflects the belief that well-trained, intelligent generalists can discharge effectively any responsibility given to them. No hole is too round for these square pegs to fit in. Modi has now extended this practice to ministerial positions as well. Even so, the assignment of some of the portfolios is puzzling. For example, one would have expected that in view of their background and experience, Puri, R K Singh and Alphons would have tasks related to diplomacy, internal security and urban affairs respectively. Instead, they have urban affairs, power, and tourism, respectively. That seems to defy conventional logic of finding a fit. The generalist is expected to be the master of whatever trade he finds himself in, which is debatable. The bureaucrat knows that any charge he holds is not permanent and he has complete job security barring grave misdemeanours on his part. In the event of a failure, he would most likely be rapped on the knuckles or, at worst, get a punishment posting. He generally shrugs these off as a duck does water on its back. Ministerships are by contrast high risk occupations. Mere perception of non-performance could lead to virtual demotions or worse. While these surprises livened up the television studios and opinion pages after what was expected to be a dull and routine affair, pundits could at best second-guess, at their own peril, Modi’s motive in springing them. Could it have been shock therapy? Yes, may be, but perhaps no, because many of the departments under new incumbents were reasonably well-run. Possibly only the party president and Modi’s closest confidant, the redoubtable Amit Shah, may have had a clue. Modi is one of the two heads of government using social media extensively. But unlike Donald Trump who conveys not just his innermost thoughts -- and prejudices -- but also major policy shifts on Twitter, Modi’s tweets are often innocuous: Congratulations and greetings, or sympathy for victims of accidents or tragedies. Modi has shown an enormous penchant for risks that would deter most other politicians and emerge the winner, demonetisation being the most prominent such instance. It reflects on his unerring -- so far -- ability to gauge what people will accept readily. The reshuffle was undoubtedly long overdue, necessitated by many ministerial vacancies. Given these surprise decisions, perhaps we ought to also think of it as Modi’s throw of dice in the face of a faltering economy and a worrisome security situation. But we really do not know. We can make only one prediction with certainty: Modi will continue to take the nation by surprise, catching his political opponents offguard, and we will all clutch at any straw in the wind to read Modi’s mind. 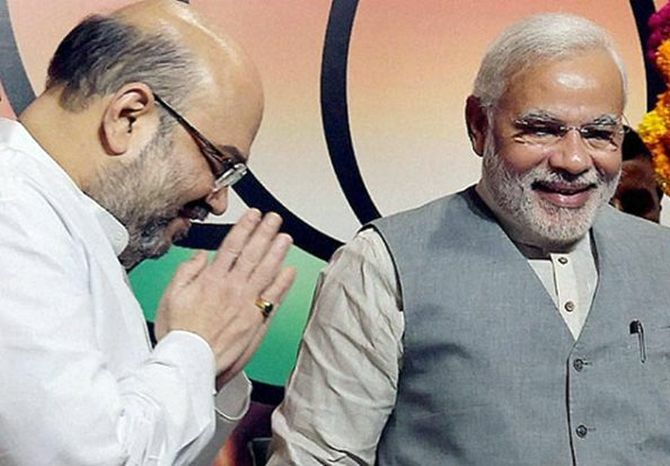 Image: BJP president Amit Shah with Prime Minister Narendra Modi. Photograph: PTI Photo.